In a matter of months, cooler temps will be on our doorstep so why not bring your garden outside in. 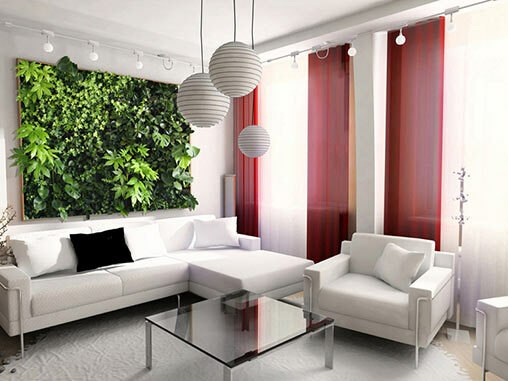 My client and I are developing and designing a vertical garden wall in her living room with the help of a landscape architect. After doing some research, this is no small undertaking but I am looking forward to the end result. If your working with a black thumb or need a hassle free indoor garden try playing around with succulents. Succulents are resilient, low maintenance and come in a variety of shapes and sizes. Grouping succulents together can create a fun aesthetic to any home environment. 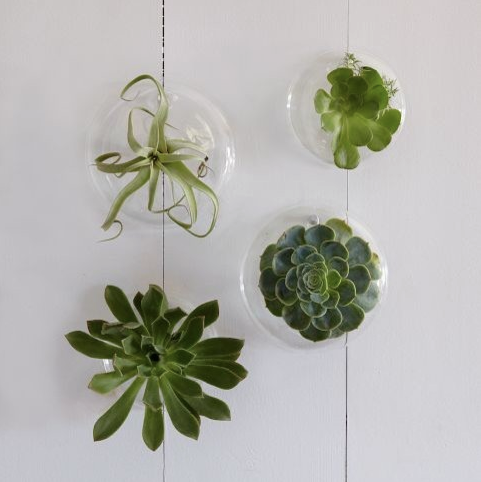 Need something to house your plants in, then look no further than West Elm glass bowls to hold your newly purchased succulents. 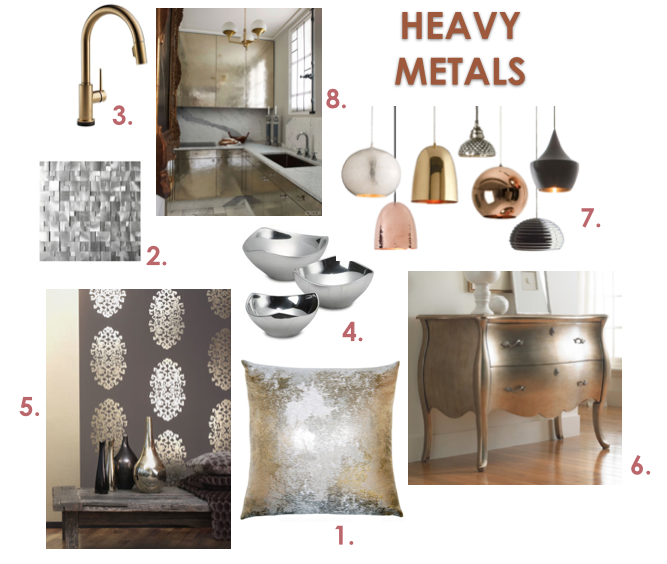 Not sure about you but my affinity for all things metallic is growing everyday. We have become accustom to brushed nickel, stainless steel, chrome and oil rubbed bronze but brass and gold are making a strong and not to be ignored debut. Don’t worry, its not the brass and gold of yesteryear. The reinvented finishes finishes of today have a contemporary spin making it suitable for all types of uses from pillows and accessories to faucets and lighting. Last year in May we put the finishing touches on a fun new construction project we designed in ’04 (a namesake given to one of the most sought out neighborhoods in Austin). 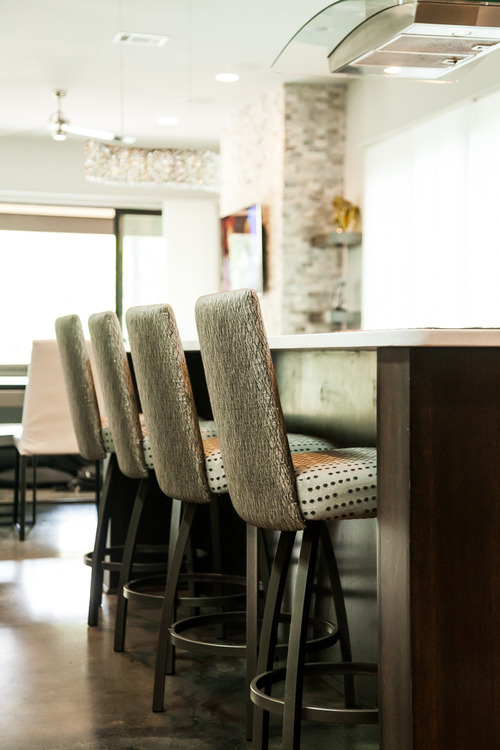 This home was a blast to work on with the client who let their easy-going and fun-loving personality shine with the selection of each piece of furniture. The main focal point of the dining room is the dining table that converts into a pool table from a German company called Fusion Tables. Above the dining table is your not so standard pool light fixture. TheSchonbek chandelier adds that touch of elegance without feeling to over the top and can been seen sparking above when viewing the house from the outside. 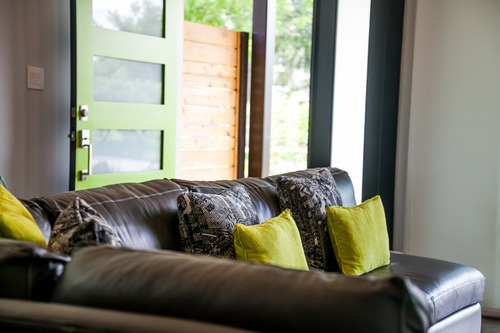 Pops of lime green are seen throughout the house starting with the front door and onto the pool table felt. 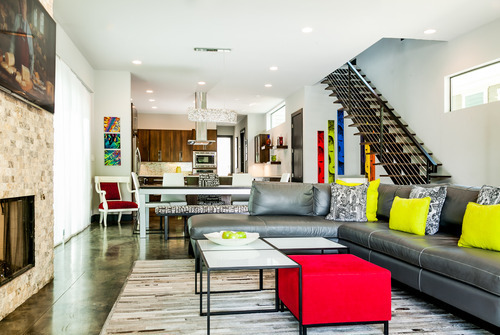 Mixing in the color red was just one of the many ways this space is so unexpectedly AWESOME! 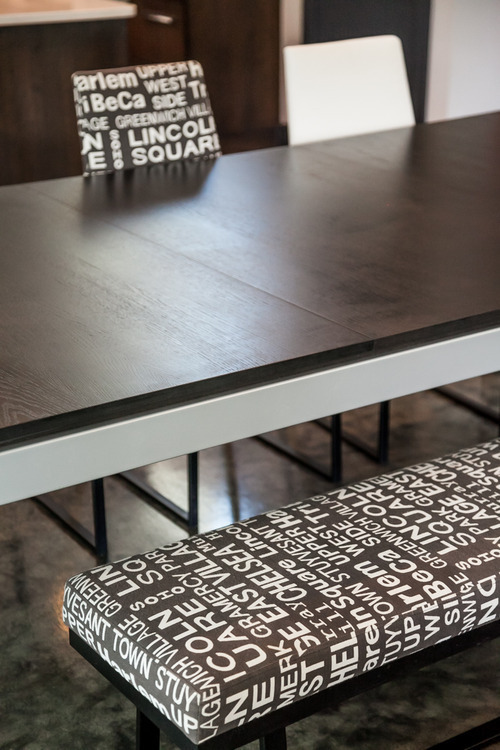 When not being used a pool table, a mix of upholstered chairs and a bench flank the dining table. If you look closely, the fabric is embossed with famous New York City landmarks. See more photos of the living room here and view the complete project! A recent residential project consisted of contemporary new construction. 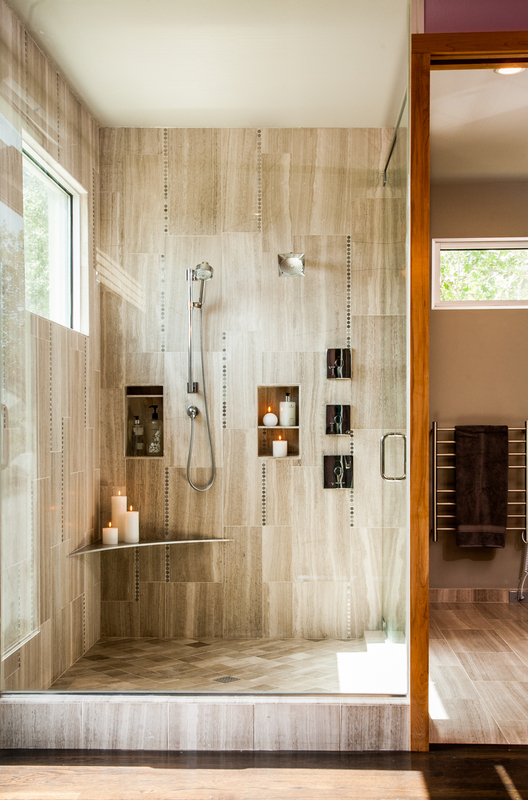 See how the design of the handcrafted cabinetry of the kitchen, stairwell, and master bathroom make this a retreat for the couple who live here in Central Texas. Emphasis on the use of natural materials in a clean way allow for a space that is warm, inviting, and completely livable. View more project photos. This month, AJID attended Sherwin-Williams Colormix 2013 event where next year’s color forecast was revealed. As designers, we realize all the potential a color possesses to transform a space. Check out these colors recently used in a project. Deep, reflective, a chance to decompress. This color is true to its name, relaxing and cool. Bright, cheerful, but not over zealous. This yellow is a warm color, but perfectly toned as to not being offensive. And when used well, provides some much needed cheerfulness during those overcast days. Clean and clear, like the sky in the early morning light. This blue lets you meditate on the day to come, providing a feeling of serenity and calm. AJID had a lot of fun re-designing this kitchen! Click to view MORE before and after photos! Cabinetry: Warm, dark-stained shaker-style Walnut cabinetry. Storage is now concentrated in a larger island and anchored by a large bank of cabinets along cooktop wall. Countertops: Clean, bright white quartz adds a lighter quality to space. 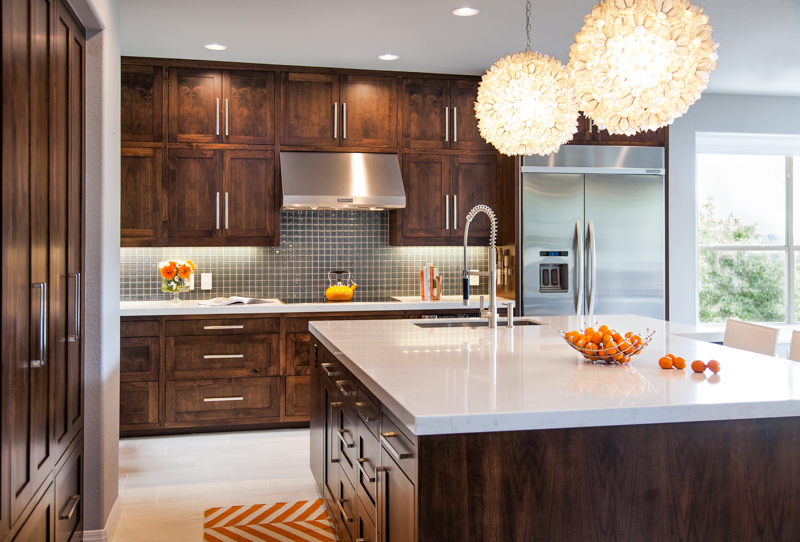 Lighting: Bright, modern orb pendant light fixtures give the kitchen a touch of whimsy. Flooring and Tile: Light colored porcelain in 12 x 24s are used to offset the walnut cabinetry. A simple wall of 2 x 2 blue glass tile backsplash gives serenity to the space. AJID was selected by Houzz.com to partake in a video promoting the consumer benefit of using Houzz.com. The video depicts a bit about how Allison Jaffe Interior Design works with clients.Click here or on the video to watch! 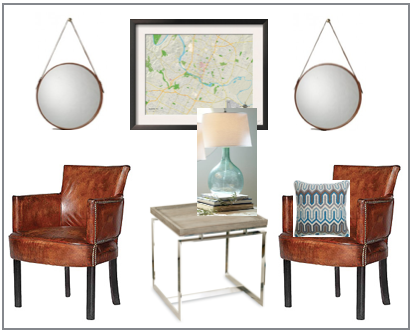 “Spruce up interior spaces by incorporating this eye-catching hue in paint, accent pieces and accessories. As adaptable as it is beautiful, Radiant Orchid complements olive and deeper hunter greens, and offers a gorgeous combination when paired with turquoise, teal and even light yellows. 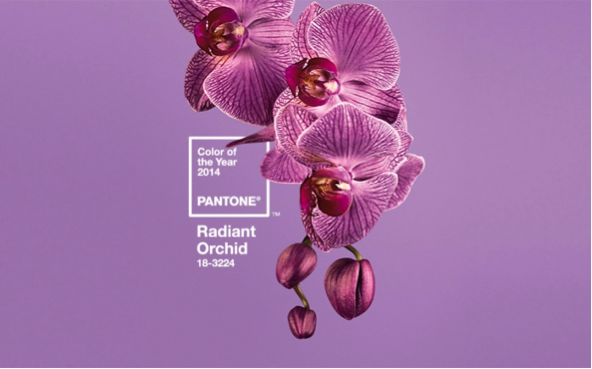 In other words, Radiant Orchid is a bright color not for the faint of heart! Being a purple hue, it’s color psychology is that of regality and the exotic. We particularly like the idea of sparking a neutral palette with this color. It’s also a color that will welcome in the spring season nicely. You’ve been there, waiting for your dentist’s appointment, and you’re feeling, well, not cozy. In the typical commercial lobby, it seems that some of the design ideas came straight out of a catalog with minimal inspiration that leave the end user, the customer or client, feeling stoic. However, that doesn’t have to be the case! By improving the ambiance of a lobby, a business serves to gain something positive: a good first impression and a feeling that their guests’ comfort is important to them. In a current AJID project, the “living room” philosophy is applied. 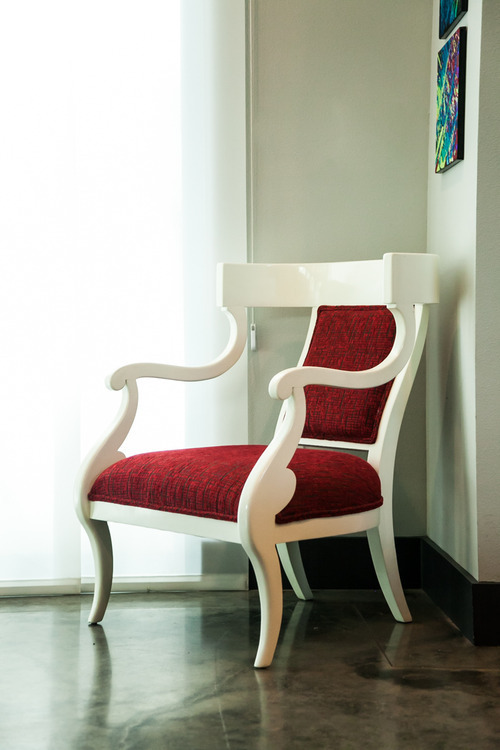 Let’s start with seating—afterall, it is the most important piece of furniture in a lobby! Using handsome leather arm chairs with accenting nailhead trim gives the guest a comfortable seat that is also nice at which to look. Something else nice to look at is the variety of fun and smart art, pieces that engage the customer and make them feel connected to their surroundings. Use of sleek, chrome occasional tables topped with an artisan glass lamp or interesting accessories provides another opportunity to accentuate the space. By combining materials and colors in a way that feels and functions like a living room makes everyone feel at home, and happy to return. In May of 2013 AJID completed this gem in the ‘04 neighborhood of Austin, Texas. What makes this home so special is the vibrant personality of the clients. 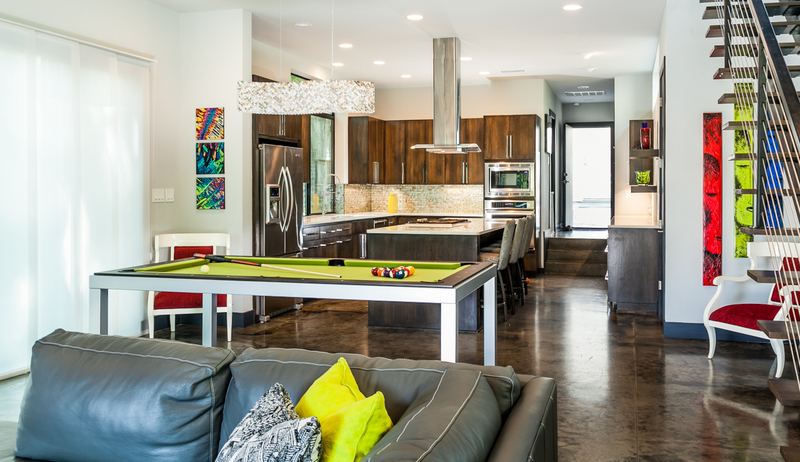 The unique color combinations, the dining table that transforms into a pool table and the quality and selection of furniture make this space ideal for entertaining. Check out more photos of the project below.